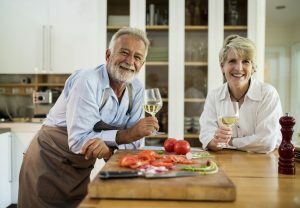 With the trend of people want to stay in their homes as they get older, there are several things that should be addressed around the house in order for the house to be safe for elder residents. If you have been in your house for a long time, raising a family and having pets your house is going to be a great source of memories and warm feelings. It can also be a treacherous obstacle course. One of the worst accidents that can happen is a fall. Where a younger person would just get up and brush themselves off, for an older person a fall can be dangerous and even fatal. A fall can result in broken bones, like an arm, leg, or even a hip. Even if the fall itself is not serious, if your loved one is unable to move or call for help after a fall, the result can be catastrophic. When it comes to making a home safe, there are a lot of general things you should do. Make sure carpets, area rugs, and floor coverings, especially on stairs, are secure. Make sure the area rugs are flush to the floor to they do not provide a tripping hazard. Look around your rooms to see that the pathways from room to room are cleared, straight, and open. Test the lighting in the home to see that there is adequate lighting at night where there is no light coming in through the windows. The room that has the biggest risk is the bathroom. Safety bars should be installed around the toilet and bathtub and shower stalls. There are plenty of additional safety features for bathroom that can be researched and installed to keep your loved one safe. Instead of providing a long checklist of things that should be looked at, it is more important to go through your individual home to look for items that can be dangerous. One additional area that should be checked is to see if you have a good 24 hour monitoring system. At Home Senior Care will work with you to ensure that your loved one is protected. Through the use of cameras, sensors, video calling, an alert button, and live technical support to make sure the system is monitored and is in good working order. Some people will keep their homes exactly as it was through the years. It becomes a monument to the your family and the great times that have been hosted in your house. If you decide to remain in your own home through your golden years, it is important to make sure your home is ready for you to enjoy for more years to come. If you have any questions about our 24 hour monitoring service, please call our office at 855-419-3109. While you are asking about monitoring take advantage of our 3 free hours of companion care services. We know you want to be there for your loved ones. We can be there when you can’t. Think of us as family. 2019 © At Home Senior Care. All rights reserved.